My plan when I started this blog back in 2009 was to use it to as a platform on which to explore the connections that exist between landscape and identity. Such connections are abstract and intangible; consequently I have touched on the topic infrequently and obliquely. A recent work trip to the US provided me with the time and space to re-read a favourite book that has a lot to say on this subject, Bruce Chatwin’s ‘The Songlines’. Published in 1987, the book describes Chatwin’s travels among the Aboriginal peoples of the area surrounding Alice Springs in Australia’s red centre. 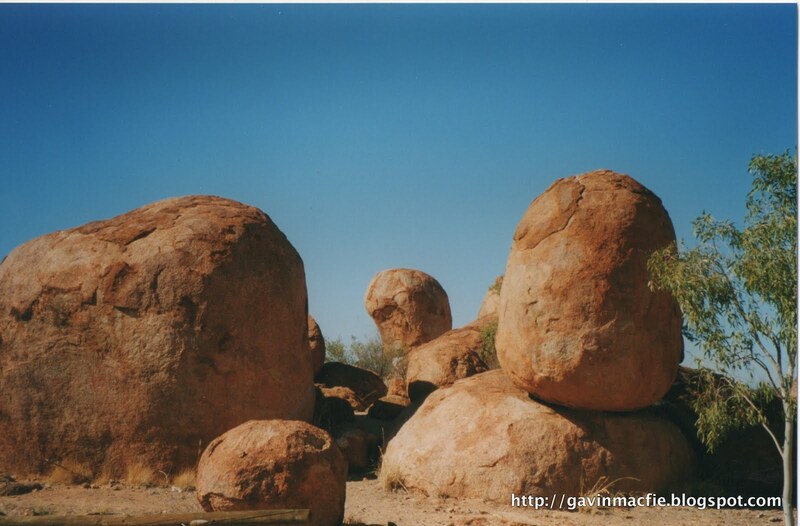 He gained access to these normally reticent people courtesy of Arkady, who was surveying the route of a proposed railway between Darwin and Alice Springs, working with the traditional owners to identify their sacred sites so that the railway could be built with as little adverse publicity as possible. ‘The Songlines’ paints a vivid picture of the country and its inhabitants. But it is more than a travelogue, along the way Chatwin lays out his ideas on nomadism and on the roots of human aggression. Almost twelve years had elapsed since I read ‘The Songlines’ for the first time. The aspect of the book that stuck with me over that time was its description of the Aboriginals’ deep and complex relationship with their land, which I will attempt to summarise below. The song lines or dreaming tracks are known to the Aboriginals as the ‘footprints of the ancestors’, legendary totemic beings that wandered over the continent in the Dreamtime, singing out the name of everything that crossed their paths, singing the world into existence. The ancestors were generally animals; for example kangaroos, echidnas, budgerigars, ants or termites. The ancestors fashioned themselves from clay and traveled through the country scattering a trail of words and musical notes along the line of their footprints. 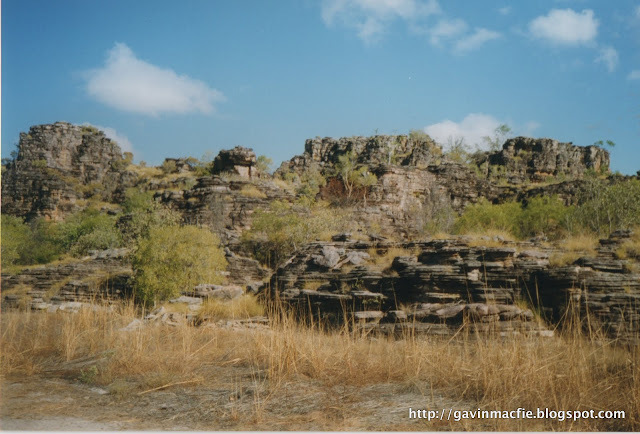 The concept of going on walkabout – disappearing into the bush for weeks or months on end – was popularised by the film ‘Crocodile Dundee’, however I don’t recall Paul Hogan mentioning that when an Aboriginal goes on walkabout he retraces the steps of his ancestor and sings the ancestor’s songs, recreating the Creation. For the Aboriginals the land existed first as a concept in the mind, only once it had been sung did it really exist. Everyone inherited, as his or her own private property, a stretch of his or her ancestor’s song and the country over which the song passed. A man’s songs were the title deeds to his territory. One may lend or borrow song, but never sell or destroy them. Stops are handover points where the song passed from one’s ownership, perhaps to a member of a neighbouring tribe in who shared one’s dreamtime ancestor. Elders would advise travelling only 2 or 3 stops down the songline, but man may acquire ritual knowledge, thus extending his song-map and his territory. If a man strayed from his songline without first acquiring the necessary songs, he was trespassing and could expect rough treatment – even a spearing – from the owners. But if he had the song he could rely on their hospitality. Most tribes speak the same language as their neighbours, or at least a similar one. However, song cycles may pass through many language barriers, for example following lines of reliable waterholes from Broome in the Northwest right through the centre to Adelaide in the South, passing through 20 languages en route. For example in 1900 an Arnhemlander walked from his home, northeast of Darwin, to the south coast. There he found a wife, who he took home to the opposite side of the continent. Her brother accompanied them on the return journey and did the reverse. 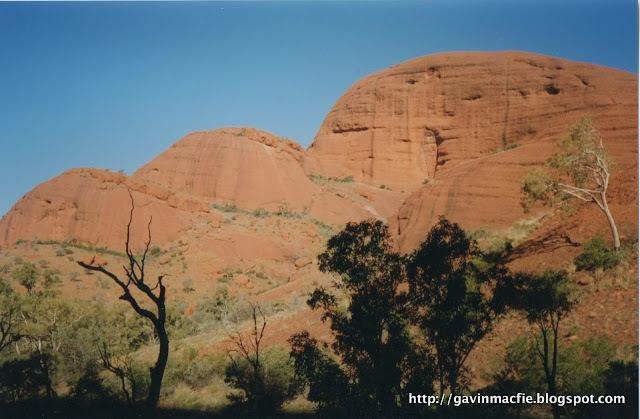 The real mystery and beauty of the songlines is that an Aboriginal would be able to recognise the land being sung by a member of another tribe from a thousand miles away, despite not knowing a word of the language in which the song was sung. Chatwin reported that at least three theories had been proposed. Firstly there was telepathy. Secondly there was something that sounded like astral projection or the shamanic ‘flying’ described by Carlos Castaneda. Lastly, the most likely explanation, which is that the land itself was encoded in the melody and rythm of the song. The melodic contour describes the lie of land directly, geographical features were rendered in particular note combinations. For example a listener would be able to count the number of river crossings or changes in gradient and pick out the precise position on a songline. The music of the dreamtime was thus a memory bank for finding one’s way about the world. Chatwin tells of accompanying a group of Aboriginals in a Toyota Landcruiser, bumping along a dirt road. He noted that one of the men was singing very quickly, his lips a blur. The cadence of his song altered with the speed of the vehicle, suggesting that his song described the country in real time, at walking pace. In Aboriginal belief an unsung land is a dead land: if the songs are forgotten the land itself will die. Periodically the elders of a totemic clan may decide that it was necessary to sing their song cycle from beginning to end. All owners would assemble at a ‘Big Place’ and sing their sections in order. 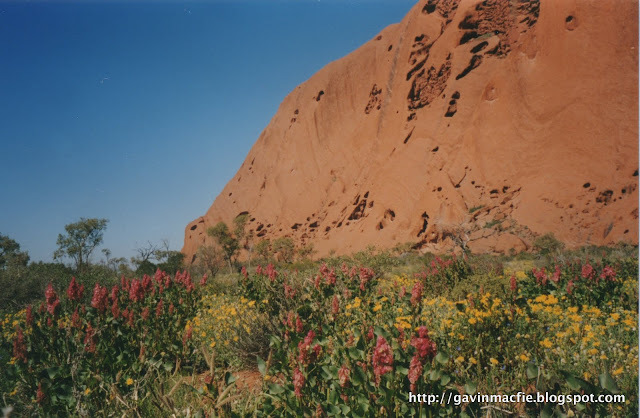 A Big Place would be a significant landscape feature, such as those in the photographs that accompany this piece, Uluru, Kata Tyuta, Kakadu and Karlu Karlu. Many songlines would converge at a Big Place making them important for trade and for arranging marriage between members of different tribes. The Aboriginals of Australia are unique in having maintained a stable and mature hunter gatherer society for tens of millenia, perhaps fifty thousand years. Hence their beliefs may provide the best window available into the minds of our own distant ancestors. There are other constructs that are remeniscent, to some, of the songlines: Britain’s ley lines; the dragon lines of Feng Shui; Lappish singing stones; the Nazca lines of Peru. Yet Chatwin felt the songlines not be be a peculiarly Australian phenomenon, but to be universal; that they were the means by which man had marked out his territory and organised his social life. All other successive systems were variants – or perversions – of this original model. The main songlines in Australia appear to enter the country from the north or northwest – from across the Timor Sea or the Torres Strait – and from there weave their way southwards across the continent. It is possible – perhaps probable – that they represent the routes of the first Australians as they traversed the country around sixty thousand years ago. Chatwin presented an enchanting vision of songlines stretching across the continents and through the ages, speculating that wherever men have trodden they have left a trail of song, and that these trails must reach back in time and space to the region in Africa’s Rift Valley from which all modern humans originated. We may now and again catch an echo of these trails of song. Chatwin speculated that the whole of classical mythology might represent a totemic geography of the ancient world. I have not read his later work and so don’t know if he was able to expand on these ideas prior to his death in 1989. It strikes me that these echos may even be audible in Scotland, that through legend and placenames it may be possible to reach back through time and to see into the minds of the first hunter gatherers that migrated into Scotland at the end of the ice age, eleven thousand or so years ago. This may seem far-fetched, but let me give you an example of an echo that I heard on my recent trip to the Isle of Jura to view the Corryvreckan whirlpool. Corryvreckan has been translated as ‘cauldron of the plaid’. The plaid in question was owned by the Goddess of Winter, Cailleach Bheur. As winter approached the Cailleach could be heard washing her plaid in the swirling waters of the Corryvreckan for three days – possibly a reference to the enhancement of the whirlpool’s roar by the equinoctial gales. After such treatment the plaid was pure white and became the blanket of snow that covered the land. Placenames containing Cailleach are common in Scotland and are often translated as ‘old woman’ or ‘witch’. But could it be that all these Cailleach landscape features are linked to ancient legend, and that a route connecting them might trace the path taken by some form of dreamtime ancestor and by inference the migration routes of the first Scots? I’m going to finish by restating the Aboriginal belief that an unsung land is a dead land: if the songs are forgotten the land itself will die. I visited that wild west coast of Jura twice in 2011 and both times I publicised it online through word and picture (see the first visit here). Being actively involved in the popularisation of wild places makes me slightly uneasy, for part of the attraction of these places is that one can count on not meeting other people. But I believe it is also important to spread the message and keep the place alive, after all would I even have been there had W.H. Murray not inspired me by writing of his visit? For me that rugged coast will always be there, and it will always be important. But if no-one ever went there, if its beauty remained unseen – and it has been seen less and less over the centuries – at what point could it be said to no longer exist in any real sense? As I stood alone atop the flat-topped stump of Aros Castle behind the Glengarrisdale bothy, admiring the view out to sea and thinking these thoughts with the wind in my hair, I would like to think that in some small way I shared the feelings of deep reverence and connection with the landscape that an Aboriginal experiences as he sings his country into existence. its a great book and I must re-read also. Very much enjoyed you bringing it back home to Jura, fascinating stuff. I’ll have to look up ‘What am I doing here’, his last book, and also reread ‘In Patagonia’. Such a shame that he died just as he was getting onto his stroke. I have yet to discover anyone else that is capable of carrying off his style of writing. I read this book after my first trip to Australia and it really gave me a deeper insight into the landscape and conditions. Here we have predictable seasons but with the wet and dry cycles there occuring at seemingly random intervals,some times many years apart you can see how the culture would evolve over time to make some sense of that.Great book and post. As an Australian I read this book quite a while ago and having visited many outback areas I can very much relate to what is written in the book, especially the Australians Aboriginals ability to navigate via the song lines which was a consequence of their oral culture. Thanks for reminding me of such a wonderful book and a great author. The word “cailleach” means old woman in Gaelic, not hag as wikipedia would have you believe. Yes it could be used that way but I think any reading into it’s landscape use and extrapolation that it’s related to some legend would be wrong. Most of the references to cailleach, and he genitive caillich, will be to real people who lived in the last 500 years. I , too, am a scientist and writer; so I can appreciate your perspective and interest in a variety of subjects. I have just read the book and I fell in love with the idea of harmony between man and nature being sung over the centuries. Songlines are such a magnificent manner to choreograph one’s place in the macro and micro scheme of destiny.